I do not quite understand about the Nikko pass. I am planning to buy Nikko world heritage pass for 2000 yen. Is it included return train ticket from Asakusa to Nikko ? or I have to buy train ticket separately ? On tobu s website, I see only limited express train for sell. How to choose rapid train? On Hyperdia I see 1,360 yen for one way ticket. Is it the price for limited express or rapid ? Is it necessary to book in advance ? Im planning to go there for a day during the week of 20 november 2018 but I would like to check the weather forecast first. And for one day trip which pass should I buy please ? I just would like to see The famous bridge, the water fall and temple. I used to buy JR pass but I did not travel ;much. I find out that there are others ways to travel around japan. Nikko World Heritage Pass includes Asakusa-Nikko round trip base fare. You can take Rapid train without any extra payment. If you take limited express train, you have to pay limited express surcharge. You can purchase it at Asakusa station on the spot. I think you may purchase Nikko Pass All Area. Because Nikko World Heritage Pass does not cover Kegon fall. Nikko Pass All Area covers Kegon fall. I would like to go to nikko from shinjuku and return from nikko to asakusa. Would it be more cost effective to purchase a nikko pass or purchase the tickets seperately. But these passes do not cover Shinjuku to Nikko direct trains. You have to take subway to get Asakusa and take Tobu railway. There is no deals to cover both Shinjuku-Nikko and Nikko-Asakusa. I will be going to Nikko for 2 days (26-28 Oct) from Narita Airport and back to Tokyo after that. What is the best option? Should I get any JR pass? Is Kirifuri-kogen worth a visit? You can get Asakusa by Keisei railway by a regular ticket. And then use Tobu Railway Nikko Pass. If you have an extra time, Kirifuri Kogen is worth visiting. i live in Tokyo and planning to visit Nikko for 1 day trip. Considering the following itenary. Do you think this can be covered in a day? Is Nikko all area pass a good option for this? We are planning to travel in the second half of December. It’s not impossible but it will be very very tight. I think you will spend 5 hours to visit Toshogu, Kegon falls and Chuzenji lake after arriving Nikko. And then you will spend about 30 minutes to move to Kinugawa onsen to visit suspension bridge and boat cruise. You will have a lunch time in this trip. I’m Lysa from Indonesia and I will visit Japan next month (Nov 15-24). I’m interested to put Nikko on my itinerary but since I’ll be travelling solo I still thinking about it. Is it easy to reach Nikko from Tokyo? Nearest station from my hotel will be Ikebukuro Station. The hotel staff said that there is express train operates direct from Ikebukuro to Nikko but I cant find any info about it. Is the info correct? Because so far I only know to reach Nikko are from Shinjuku, Asakusa and Ueno. If you cannot take this direct train, you can take a local train from Ikebukuro to Omiya and then catch Shinkansen to Utsunomiya. You can take a local train from Utsunomiya to Nikko. I’m gonna travel alone too from Indonesia on 12-16 Nov, I also wanted to go to Nikko, if you wanna go together, we could go together. Hi Takeshi, can I check if I can use the JR east tohoku pass to travel between Shimbashi and Kinugawa using Toei Subway Asakusa Line for AOTO and TOBU LTD. EXP REVATY AIZU 111? Thanks!! No, it does not cover this route. This pass covers Tobu Railway train only which depart from Shinjuku. Otherwise you have to take Shinkansen to Utsunomiya, local train to Nikko and then Tobu railway local train from Tobu-Nikko to Kinugawa onsen via Shimoimaichi. My wife and I are spending two weeks in Japan in January 2019. Our last touring day is the day prior to flying home. We are planning to go to Nikko using the last day of out JR pass. I have not been able to find a timeyable for the trains in and out of Nikko from Utsunomiya. Is it possible to point me to a suitable timetable? There is no copies of timetable of Nikko line. Please use hyperdia to find it. I plan to visit Nikko in my upcoming trip in November and use the Nikko All Area Pass. I will visit Yunishigawa Onsen on Day 1 and then Nikko on Day 2. My question is will the pass cover the trip from Kinugawa Onsen onwards to Yunishigawa Onsen and the bus to the ryokan? Also, if I take Tobu Ltd Express train between Kinugawa Onsen and Tobu-Nikko, how do I pay for the reserved seat fee, and do I have to reserve the seat for such a short ride? This pass does not cover further than Shin-Fujiwara. Shin-Fujiwara is one station away from Kinugawa onsen. So Yunishigawa onsen is not in the coverage area. If you take limited express train, you need to pay and you have to reserve the seat. All seats are reserved seat. You cannot take a train without reservation. Thank you very much, Takeshi! 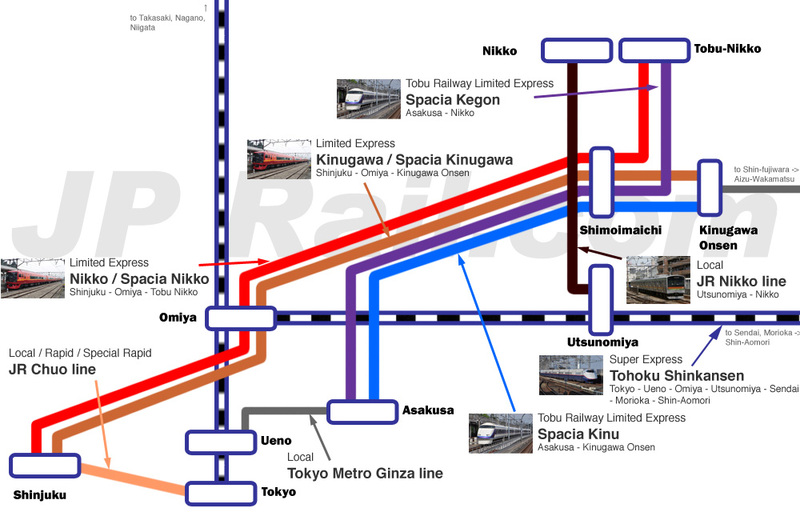 We wish to know for sure if Spacia Kegon, which leaves from Asakusa, is included in the Tokyo Wide Pass? I’ve seen your note that Spacia Nikko is fully covered by the pass, but no mention if it is the same for Spacia Kegon. Just want to be sure of our options. Another thing, we’re planning to get the Tokyo Wide Pass because we’re also visiting Gunma after a day or two in Nikko. Is there by any chance a way to go straight from Nikko to Gunma via train/bus? If so, is it covered by the Tokyo Wide Pass? Or are we better off traveling back from Nikko to Tokyo, and then Tokyo to Gunma? Thanks in advance for your help. Cheers. Any Tobu train from Asakusa station is not covered by Tokyo Wide Pass. Some Spacia Nikko depart from Shinjuku. These are covered. There is no direct ways to get Gumma from Nikko. You don’t need to go back to Tokyo. You can change Shinkansen at Omiya. My itinerary for one day in Nikko is: Toshogu Shrine, Akechidaira ropeway, Chuzenji Lake and Kegon Falls. My hotel is near Ningyocho Station. Should I take Nikko all area pass, or take Nikko city area pass and buy bus pass to chuzenji lake? I will go on weekdays, if I take the 07:30 train (Kegon 5), do you think I would be able to see all? Also, Is the construction works in Toshogu Shrine already done in May 29-30? Nikko all area pass is better choice because bus pass is 2000 yen. Bus pass + city area pass is more expensive. You can make all places in one day. Nikko Toshogu is still under construction until next spring.